According to Islamic tradition, the animal is brought to the place of slaughter and laid down gently so as to not injure it. It is Sunnah but not Fard that the head of the animal be facing the Qiblah. The blade must be kept hidden until the very last moment while the jugular of the animal is felt. The conventional method used to slaughter the animal involves cutting the large arteries in the neck along with the esophagus and trachea with one swipe of a non-serrated blade. Care must be taken that the nervous system is not damaged, as this may cause the animal to die before exsanguination has taken place. During the swipe of the blade, the head must not be decapitated. While blood is draining, the animal is not handled until it has died. So why do we see videos every 'Eid showing people violate these laws completely in the streets? 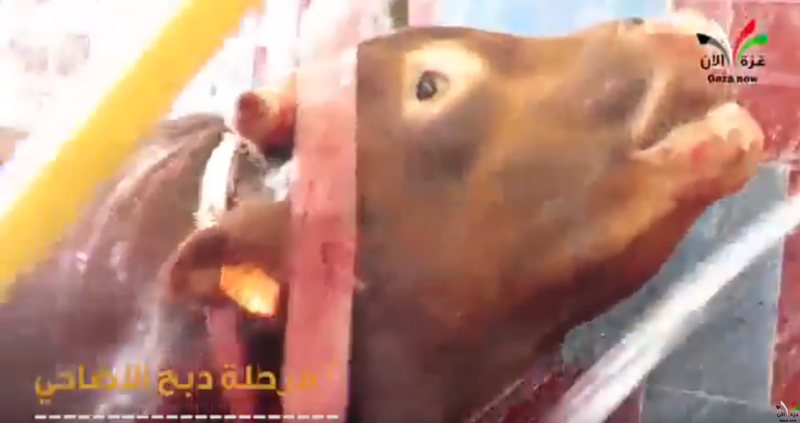 Here's one horrific slaughter that happened in Gaza yesterday, showing a man repeatedly stabbing a frightened cow in the neck, over and over again, while it slowly bleeds to death. We've seen dozens of equally horrific 'Eid videos before. And it isn't only Gaza - there are lots of videos from all over the Muslim world showing people in the streets publicly torturing animals,all in seeming violation of Islamic law. Sometimes, PETA will come out with a condemnation. But if Muslims are serious about Islamic law, then where are the condemnations from Muslim leaders over this barbaric practice that is seen year after year?